MOUNT PLEASANT, Mich. — Senior quarterback Cooper Rush threw six touchdown passes and Central Michigan, trailing 21-14 midway through the second quarter, scored 30 unanswered points to pull away for a 44-21 victory over UNLV on Saturday afternoon at Kelly/Shorts Stadium. Rush finished 20-of-33 for 352 yards as the Chippewas (3-0) rolled up 499 yards in total offense while holding the Rebels (1-2) to just 313. 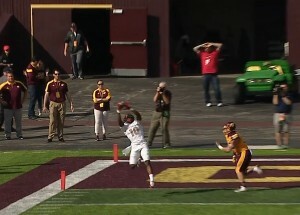 Wide receivers Corey Willis and Mark Chapman each caught a pair of touchdowns for Central Michigan while Jesse Kroll and tight end Tyler Conklin each had one. 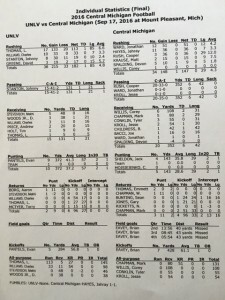 UNLV quarterback Johnny Stanton, victimized by at least a half-dozen dropped passes, finished just 15-of-41 for 131 yards, including a 13-yard touchdown pass to freshman Darren Woods Jr. that gave the Rebels a 21-14 second quarter lead, but was also intercepted twice. Sophomore running back Lexington Thomas had the fifth 100-yard rushing game of his young career, garnering 113 yards on 17 carries, including a 85-yard touchdown run. UNLV’s other touchdown came on a blocked punt by sophomore linebacker Bailey Laolagi that freshman running back Charles Williams recovered in the end zone to give the Rebels an early 7-0 lead. 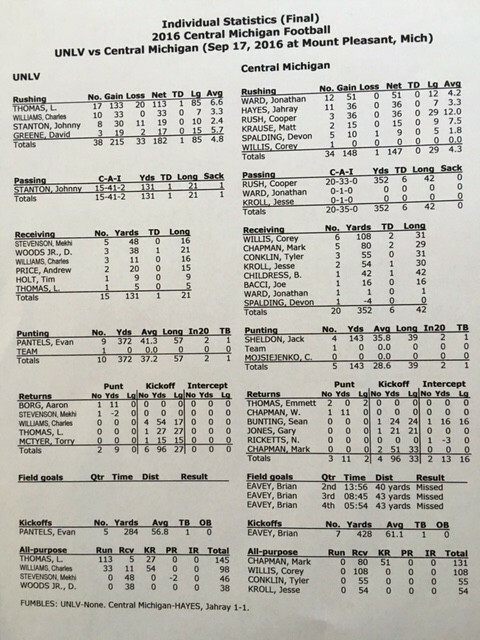 Rush had touchdown passes of 30, 13, 29, 26, 31 and 42 yards. 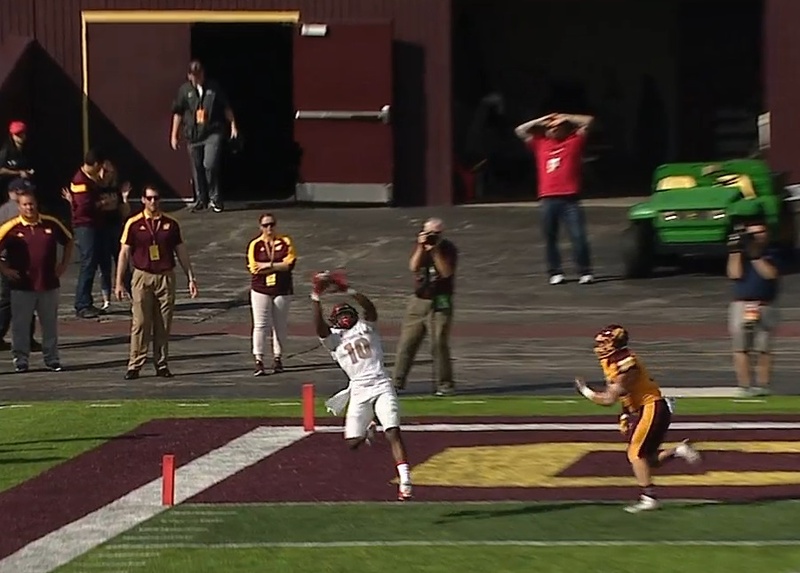 His 26-yarder to Willis with 1:51 left in the second quarter put the Chips ahead for good, 28-21 as Central Michigan outscored the Rebels, 16-0, in the second half. Freshman wide receiver Mekhi Stevenson led the Rebels with five receptions for 48 yards while Woods added three catches for 38 yards and touchdown. All-Mountain West wide receiver Devonte Boyd failed to catch a pass and had several key drops. 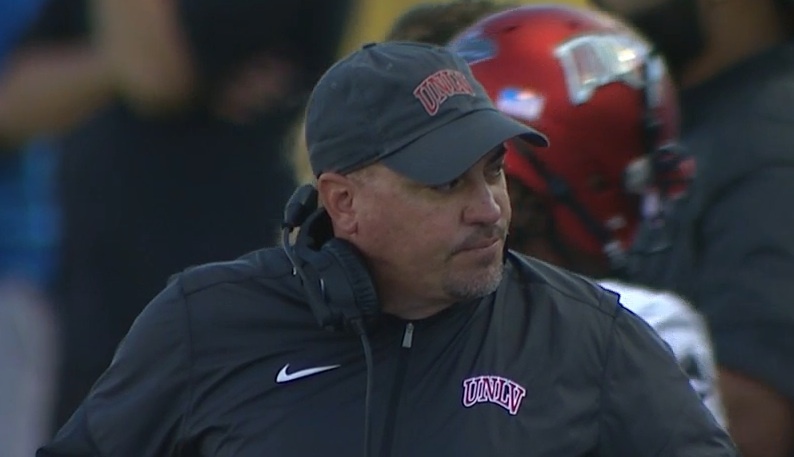 UNLV, which fell to 0-11 all-time in games played in the Eastern time zone, returns to action next Saturday night when it hosts FCS-bound Idaho (1-2), a 56-6 loser at Washington State on Saturday, at Sam Boyd Stadium at 6 p.m.